I know that I never like to see anyone get hurt or feel pain during a concert. 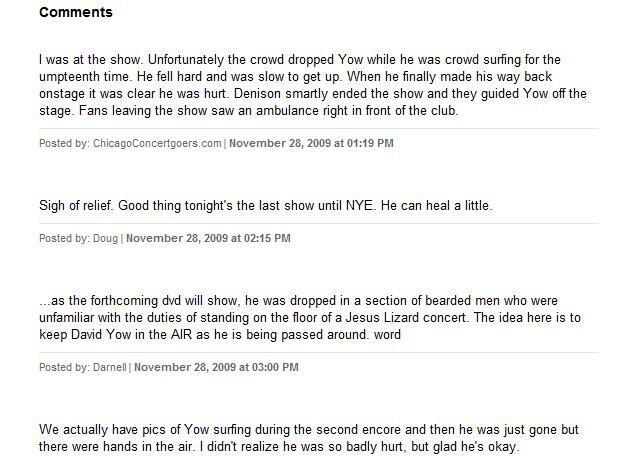 So naturally I cringed when I read Greg Kot’s update concerning the unfortunate injury of Jesus Lizard lead singer David Yow during a recent Metro show. But after reading this Yow injury update I also realized that Kot’s post, and the fan contributions in the comment, illustrates a topic we have to explore. Now, of course, commenting on live music blogs is nothing new. And fan comments can be scattered, silly and not always helpful in completing the overall story. But this time, the way these fan comments were written and posted adds a completeness and context to a live concert that I haven’t read in awhile, or even before. These comments also reveal a side of human emotion that got me thinking about how fans express the pain and compassion they feel after seeing an artist suffer during a concert. Sure, blogs present a wide-open door for the writer and fans to share thoughts and express themselves. However, I think there’s something bigger going on here with this Jesus Lizard update. As I write this post, I know it involves depending on the community of live music fans and combining our love for live music with new and social media. But I’m not quite sure what we need to do exactly. I just know that we shouldn’t glaze over this topic. We need to dive in and figure it out. Maybe you can help me flesh things out? I know only a small amount of fans make the leap and decide to leave a comment after a music review. So when I read Kot’s update I felt like I was reading something special because of how the comments told, and more importantly, completed the story for those who weren’t there. I know, fans leave comments and share their live concert experiences on music blogs all the time. But the reason I’m sharing this with you is not just because a few fans left comments on a live music blog. There’s nothing ground-breaking about that, necessarily. I’m sharing this with you because Kot’s Jesus Lizard update is about so much more. It’s about the developing relationship between concert fans and music journalists/bloggers. It’s about fans understanding how important their contributions in the comments really are. It’s about realizing that we’re in the midst of a ongoing revolution in journalism. It’s about figuring out how to continue to explore the art of telling complete concert stories using social and new media tools. I don’t have any concrete answers right now but I know we need to realize how much writers/journalists/bloggers and fans actually depend on each other to tell the best story possible. The last reason why I’m in such awe of this Jesus Lizard update is because it speaks to fact that when I review concerts I’m not always able to see the concert from all perspectives. So when I read these fan comments I loved how each individual comment added to the story in some way giving me the perspective that I’m always looking for. I’ve included a short snippet of the fan comments from Kot’s update in this post (above) but I encourage you to take a look at the whole post and ask yourself these questions. Do you see your comments on live music blogs as important pieces of concert history? Do music journalists see concert fans as integral partners in documenting live concerts? Do concert fans see themselves as contributing to live concert anthropology or as new breed of citizen journalists? What do you think about the relationship between music journalists and fans? The faster, more widespread nature of being able to document, communicate and share experiences like this is HUGE HUGE HUGE. I think the example you brought up (people commenting about David Yow) shows how much of a bonding experience a live show can be. I know that this enables anyone w/ a cell phone to become a citizen journalist, but this is amazing news for music journalists. Fans are an inextricable part of a music journalist’s work. They’re amplifying what the music journalist does by being able to tell their stories side by side. Damn! You got me pumped for the next shows I go to. That’s great Angel–it’s a honor to get a fellow fan pumped up about using technology to build community with our shared live music experiences! When you go to your next show let me know how it goes. I know we’d all love to hear about your experience and we’d love to have you share it on Live Fix, too!